Traditional beauty in rich, classic colors. Color. It's one of the most important choices you'll ever make about your home's exterior: color evokes your home's personality. The color you select will have an impact on the perception of a home's size and architectural detail. 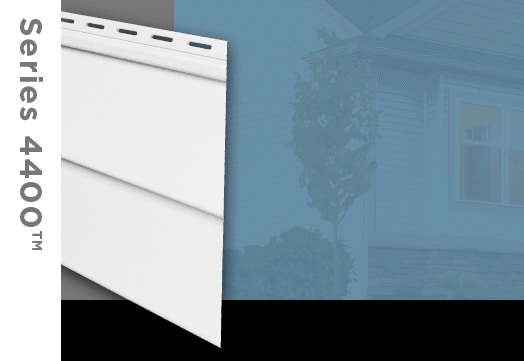 With 18 colors, including Premium Colors palette of dark, rich colors, Series 4400 Vinyl Siding has a color that's right for most every home. *Check local codes for specific wind load requirements. Actual wind speed can vary depending on building design and location. **Hampton Red available in D4 and D4.5 Dutch Lap only. ***LURAN is a registered trademark of BASF. This means you can be assured that Series 4400 complies with specific green practice criteria in the National Green Building Standard. Visit GreenApprovedProducts.com for more details.